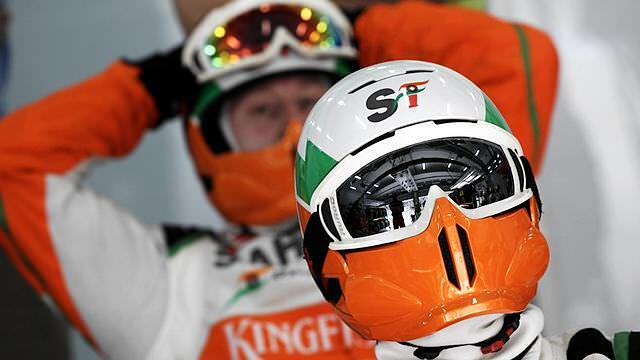 Before the 2012 season got underway, I was not alone in hoping the Force India team would be front and centre. Since joining the sport in 2008, the team have made slow but steady progress through the field, finishing last year in 6th place. 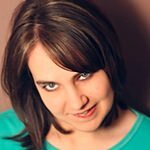 This season felt like one they could really grab. We all sensed the competition would be much closer, that Red Bull would not be walking all over everyone again. Although it would still be a long way to the top, it felt like there would be room for a new team to make a significant jump forward. After four races, the results clearly indicate that it is Mercedes who have shown the greatest improvements, whilst Force India remain exactly where they were this time last year. In 2011, four races in, the Silverstone-based squad sat eighth in the championship. Fast forward to their current position and you’ll find it is also eighth. It’s been a very quiet start to the season for Force India, and even when they were making headlines in Bahrain, it still resulted in their disappearance from view. Upsetting the bosses so that you don’t appear in any of the footage from Saturday in Bahrain is not a great way of impressing the sponsors, but the team did what they had to do to make their employees feel comfortable in a difficult position. 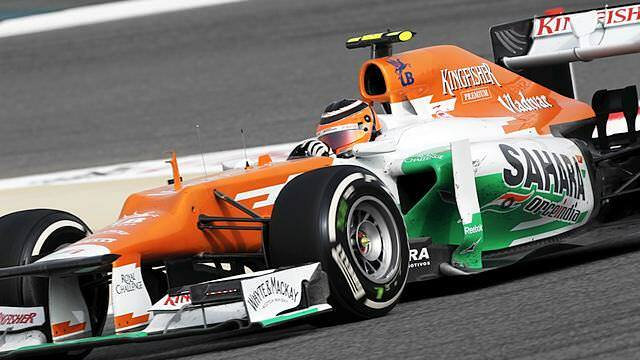 The lack of Force India coverage at the last race did mask their best performance to date, though. Of eight race starts so far this season, Force India have notched up 17 points from four top ten finishes, they have three non points results and one retirement. Their performance so far has been relatively solid in what is an outstandingly competitive field, but the desire to make those all important improvements towards the front of the grid is still obvious to all. 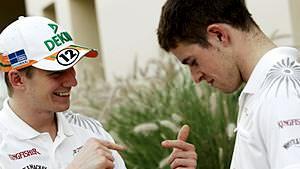 Paul di Resta has taken over as team leader, embarking on his second year with the team and in an F1 race seat. 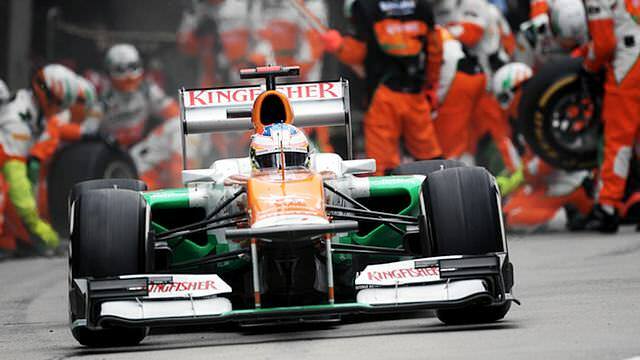 Nico Hülkenberg has also entered his second year but after a 12 month break as a tester. Starting with a new team immediately puts you on the back foot, so it isn’t totally surprising to see that the super inter-team battle I was looking forward to has been somewhat one-sided. In race pace, Di Resta has beaten the Hulk on all four occasions, with Nico also being the one to have retired in Australia. That first race in Melbourne was the only time that Nico has managed to outqualify Di Resta, moving himself into the top ten. Unfortunately, he was out of the race before it even got going, squandering his best opportunity to date. In Malaysia, both drivers suffered with poor qualifying performances, and were able to move up into the points only due to the tricky weather conditions. From a double points finish, both drivers failed to pick up points in China - the cooler temperatures affecting them negatively. Finally, the competition between the two picked up in Bahrain. Hülkenberg qualified 13th and finished 12th, which would indicate a race of very little interest. However, we know the car was capable of a lot more, and it was the very beginning of the race that put pay to any significant improvement. I think my race was decided at the very start when I had some clutch issues and the anti-stall kicked in, which really compromised my getaway and dropped me right to the back of the pack. From then on it was a long, hard fight back through the field, and it was hard work coming through the traffic. So, although he only finished one place ahead of where he began, it is actually a testament to some good, clean racing and determination not to let a bad start get you down. Meanwhile, Paul di Resta had a much better time of it, improving on his starting position of tenth place to finish in the points. His strategy meant he was one of the last to come in for a pit stop and that allowed him to lead the race at one point. He soon relinquished it to rightful leader Sebastian Vettel, but for a brief moment, Force India led the Bahrain Grand Prix. The sixth place was enough to gather some important points, however, and Force India remain close behind Williams in the constructor’s championship. Along with the handy points haul, the team have picked up some sorely needed motivation, and are heading to the mid-season test this week with their head’s held high. Deputy team principal Bob Fernley has admitted they won’t have their new upgrade package completely ready in time, but they are doing the best they can to keep up with the competition. We have some wonderful people around us who are trying to do the same thing and improve their cars. If we stay where we are, or they get a little upgrade and we get a big one, I’m not so sure yet. But even two tenths relative to the opposition nowadays is going to be massive. The team are working on it, then, and they’ve put down some good foundations to build upon for the rest of the year. They haven’t been as visible as I expected, but the potential is there for the explosion of speed and spectacle to appear as the season progresses. They may not be making headlines each and every race, but they are plodding on and working as hard as ever. In fact, the only truly invisible force this season has been team principal Vijay Mallya. Conspicuous only by his disappearance from the paddock in 2012, the larger than life boss has been replaced as figurehead for Force India by new spokesperson Bob Fernley. He was part of the restructure which saw Mike Gascoyne and Colin Kolles booted out of the team, and now that Mallya is taking a back seat, he’s made another step up. Mallya hasn’t been spotted at any of the F1 races this year, and his social media presence has been lacking any references to motorsport of late. His attention has clearly turned to other pursuits, particularly now that the new investors Sahara have moved in to show him how to run a team. Fernley provides the press conference quotes and any post-race analysis required by the media, and so it seems Mallya’s absence is not affecting the team so far. There’s certainly a sense that more management shuffling could be on the cards very soon, but for now the race team have to concentrate on the job in hand. I want to see the battle between Paul di Resta and Nico Hülkenberg take centre stage, as the pair take on not just each other but the best of the midfield around them.